chocolate | It's all about the cake! 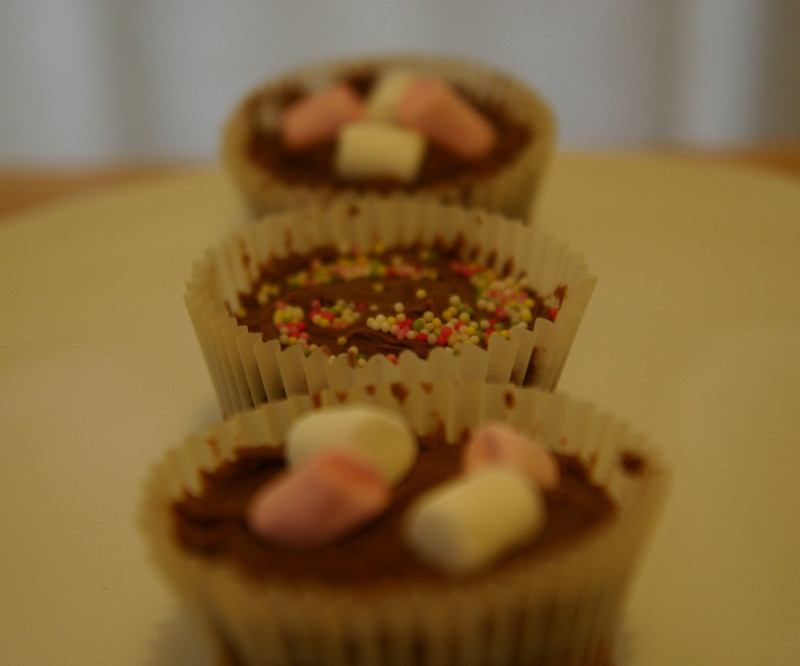 Not much to say on these really – they are cupcakes and they are chocolate. And they’re nice and quick and easy to make, with lots of lovely butter icing on top. I’ll add that they feature an extra special devil’s food base – although I personally think I could have ramped up the chocolate flavour a bit more. I would have liked to make them look a bit more sophisticated and sprinkle silver bits or chocolate things on top but, well – I didn’t have any so had to do with the multi-coloured sprinkles and marshmallows. Sophistication will come next time perhaps. Mix together the flour, cocoa powder, sugar, baking powder, salt and butter slowly until you get a sandy consistency and everything is combined. Whisk the milk, egg and vanilla extract together and then slowly pour half into the flour mixture. Beat thoroughly to combine and get rid of any lumps. Pour in the remaining mixture and continue mixing slowly for a couple more minutes until the mixture is smooth. Do not overmix. Spoon the mixture into paper cases (I used 12 muffin cases) until two-thirds full and bake for 20-25 minuutes or until the sponge bounces back when touched. When cold, spread the chocolate icing on them and decorate with whatever you can find! Mmmm! For the icing: beat the icing sugar, butter and cocoa powder together until they all come together and are well mixed. Add the milk a couple of tablespoons at a time. Once all the milk has been incorporated, continue beating for a further five minutes until the mixture is light and fluffy (this is when my cake mixer came in very handy! And I would definitely agree that the longer you beat it, the fluffier it becomes).